April Vogel Shared I finished this one last week!!! This triangle shawl with sleeves and fringe pattern is fun and works up quickly. It may actually become your favourite garment to make! This boho style cardigan gets complimented all the time You can choose to put the sleeves on or not. All the child sizes of this pattern, from 12 months to 16 years old are free. 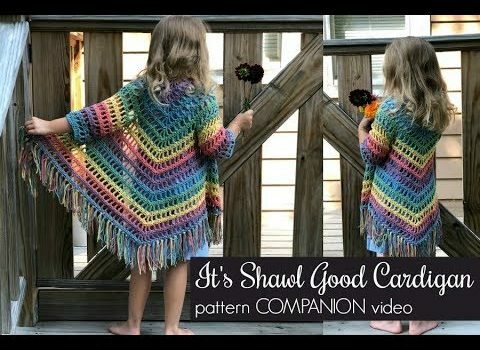 It’s Shawl Good Cardigan free crochet pattern by Ashlea Konecny is quite easy to make and has a video to help you get started. This pattern requires remarkably little yarn. We are looking to use a nice, heavy, but LIGHTWEIGHT, size yarn; we want a nice drape, which the heavier yarn provides, but in a yarn thickness that is on the thinner side. Triangle Shawl With Sleeves And Fringe Free Crochet Pattern is a great pattern, so easy and quick to make. 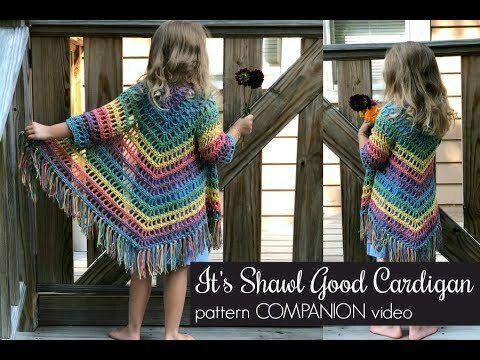 Watch the video tutorial below and follow along to make your genius triangle shawls for the little girls in your life. Get the pattern: Triangle Shawl With Sleeves And Fringe Free Crochet Pattern.